Click here to read excerpts from the book "Lev Tuvia" about Rabbi Geffen. Please click here to view The History Place™Holocaust Timeline. This is a very important site. "Inside The Kovno Ghetto" This site is from the United States Holocaust Memorial Museum. It is a very important site that tells the story of Kovno during the Holocaust with photographs. It is slow loading, please be patient and let it fully load. Kovno Also known as: Kaunas (Lithuanian) Kovna, Kovne Location: At the confluence of the Neiman (Nemunas) and Neris rivers, 100 km west of Vilna (Vilnius). Historically the second city of Lithuania, and its capital from 1918-1940. Under Czarist Russian rule, it was the provincial capital, administrative seat for much of central Lithuania, then known as Kovno guberniya. 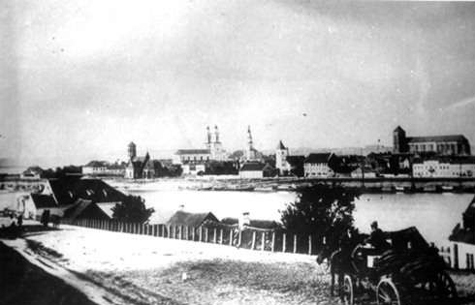 Many of our ancestors migrated from Vilkomir to Kaunas in the latter half of the 19th century. Jews were engaged in trade in Kaunas in the 16th century, but due to opposition from Christian merchants, they were prohibited from the city on numerous occasions. The ban existed until the 18th century when Jews were permitted to settle on two streets in Kaunas and to engage in trade. They were expelled again in 1753 and 1761 when there were anti-Jewish riots. The Jews found refuge in Slobodka, on the other side of the Viliya River, where a Jewish settlement had existed long before that of Kaunas. In 1782 the expelled Jews were permitted to return to Kaunas. After the partition of Poland in 1795, Kaunas became part of Russia. In 1847 there were 2,013 Jews living in Kaunas and Slobodka, 16,540 in 1864, 25,441 in 1897 (30% of the population) and 32,628 in 1908 (40% of the population.) From the second half of the 19th century, Kaunas became a center of Jewish cultural activity in Lithuania. In May 1915 an edict was issued by the czarist government expelling the Jews from the entire province. When later the city was occupied by the Germans, about 9000 Jews returned, and communal life was revived with the help of Jews in Germany. During W.W.II, after the outbreak of the German Soviet war and even before the Germans occupied Kaunas (June 24, 1941,) Jews were killed there by Lithuanian Fascists. Immediately after the German occupation, large scale anti-Jewish pogroms took place affecting some 35,000 Jews. The Jews in both Slobodka and Kaunas were moved into the ghettos. By the end of 1941, the Jewish underground, operating in the ghetto numbered 800 members. They began sending people into the forests to join the partisan resistance against the Germans. Through lack of experience and the hostility of the local population, many members of the underground were killed or captured. When the Soviet attack began in July, 1944, the Germans liquidated the Kaunas ghetto and concentration camps camps in the area, using grenades and explosives to kill the Jews. In this action, some 8000 Jews and others were sent to Germany. The men were sent to Dachau and the women to Stutthof. Over 80% of them died in these camps before liberation. Kaunas was taken by Soviet forces on August 1, 1944. Most of the Jewish survivors did not return to Lithuania. Many settled in Israel. Please read Peter Geffens description of his 2004 summer trip to Kovno, Vilna, Slobodka and The 9th Fort. Click here. To see additional Kovno pictures, click here.